Another month, another challenge, brings us another cake! One thing for sure, joining the Daring Bakers a year and a half ago helped my fear of baking cakes lessen. I still don't think I can bake a presentable cake (might be that I am far too harsh on myself, I'm forever scared that's it's not up to par. Falling, denting, not done in the middle, overbaked and dry, and never tall enough...) but instead of avoiding them I just make myself bake anyway. (following this equation I should be able to make perfect sushi, HAR!). That's what this challenge was all about; caramel, cake, caramel, frosting, caramel fudge caramel. Sounds like my kind of fare no? Loved the caramel. Loved making the caramel. Caramel flavour in the cake really shone through. I thought the cake was too dense to be really more-ish though. I do want to make it again though, this time using self-raising flour seeking elevation and lightness! Brown butter frosting was a first for me, browning butter makes me want to add onions, garlic or meat not cream! It was fairly easy to make, although adding granulated sugar instead of powdered sugar was no sign of intelligence on my part.... Resulting in grainy very very sweet frosting, adding a healthy (?!) dose of "fleur de sel de Camarque" did a whole lot of good to the quarter batch I made. 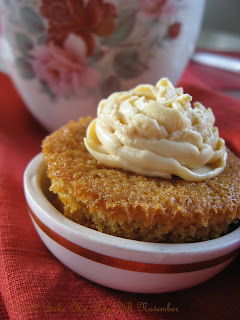 I do want to try another brown butter frosting (eh? yes!) less sweet, keeping the browned butter ánd the salt). Another hitch I encountered was using a 9" square baking tin, I wish I had opted for (mini)cupcakes instead because my kids adored this cake! They literally inhaled it... everyday after school their first question was: is there any cake left? Can we have some? My reckless confirmation made me realise yesterday that all of the cake is gone. Without me making the required full frontal pictures. Darn! There's some of that gorgeous delicious caramel syrup left; now what to do with left over caramel? Baking Soda is rubbing her hands, foolish grin on her face, drooling and dreaming.... (The onlookers know that she has to think of a way to get it out of the bottle first). 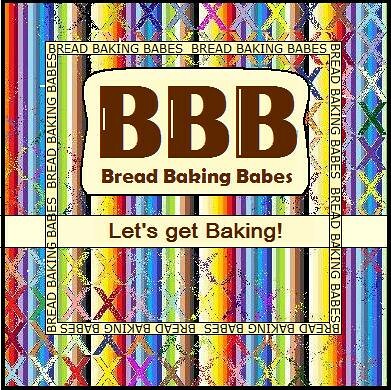 This challenge was a real team effort; three Daring Bakers combined forces and managed to include a famous chef to submit the recipe and even answer questions on our Daring Bakers forum! Great job girls! Our host: Dolores (Chronicles in Culinary Curiosity) and her co-hosts: Alex (Blondie and Brownie) and Jenny (Foray Into Food) chose to make Shuna Fish Lydon’s famous Caramel Cake. Shuna writes a very informative blog called: Eggbeater, go there! And while you're clicking away, don't forget to check out all the Caramel Bakers in the blogroll on the right hand side. Mix sugar and water to a paste in a small heavy saucepan with fairly high sides (used my Le Creuset small saucepan). Don't touch the sugar while turning the heat up to high, cooking until you'll get a nice even, dark caramel color. Take a step back and pour the water into the pan to stop the caramelization. This sputters and rises up to the sides of your pan so beware and stand back while pouring slowly and carefully. The ferocious bubbling will slow down, continue cooking for a couple of minutes over medium heat, stirring all the time with a wooden long handled spoon, to reduce it slightly. Aim for a sticky feeling when pressed between two fingers or watch the drops fall from your tilted spoon, the last drop should linger and almost pull a thread, not quite but almost. Wow, it sounds like this was definitely a winner (in spite of the granulated sugar "oops"). Maybe another caramel cake is in your future? Or you can just drizzle that caramel syrup on everything - it's just that good. Sounds like your cake came out nicely. I can't wait to see your pictures. How fun that your kids liked this cake so much!! Bet you cake was pretty as well as something the kids love. The caramel was easy this time, although I probably didn't cook it long enough. Funny that you are OK with caramel making, but not cake. Did you make the candies, too? Various dieting、beauty, healthy is written in this blog. It sees instinctively turning around when it dresses, it behaves, and the woman with beautiful appearance to walk is seen. After there is a word beautiful backing in Japan, the woman with beautiful appearance is said. Will you think it is too good somehow though it is not used now? Cake-fearers unite! How true that being a DB is the best way to overcome those fears. Looking forward to your pictures. thanks for your comment! i too am looking forward to the pictures sounds like it was a winner! Can't wait to see pictures! Glad everyone enjoyed the cake. I'm delighted that your kids enjoyed this cake as much as mine did. Although, it was really the cake they liked and not the frosting. I can't wait to see how your cake turned out. Thanks all for visiting and leaving such nice comments!! I wish I could show you the pics, currently our provider won't let me upload anything at all! I'll keep trying but this is all very frustrating.